In the summer of 2015 DeSales University underwent a massive construction project in which two articificial turf fields were added behind Billera Hall replacing a parking lot and the old track & field complex. Both fields feature a Field Turf surface and scoreboard with one practice field farthest away from the back entrance to Billera Hall with seating for about 100 fans and a game field just outside the back entrance with seating for 500+ fans as well as a press box at the top of the bleachers. 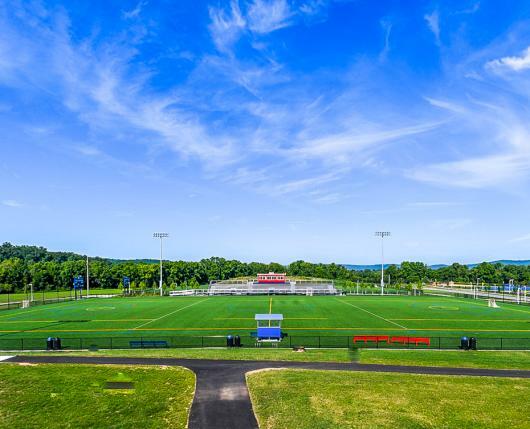 The men's and women's lacrosse and field hockey teams each practice and compete on these fields, while all other outdoor intercollegiate teams have utilized the space for practice in the early spring/late winter months. If you would like to reserve the practice turf field please contact Rachel Smith via EMAIL or at 610-282-1100 ext. 1952 to inquire about availability and the permit process.